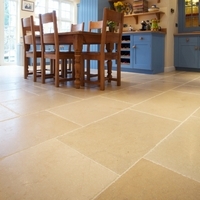 Ca'Pietra Tiles.Shaker Limestone Vintaged Floor tiles. This has a pale, sandy hue for the most sophisticated flooring. It has character too, with fettered edges and subtle markings. The perfect canvas on which to design your living room or studio, for example.